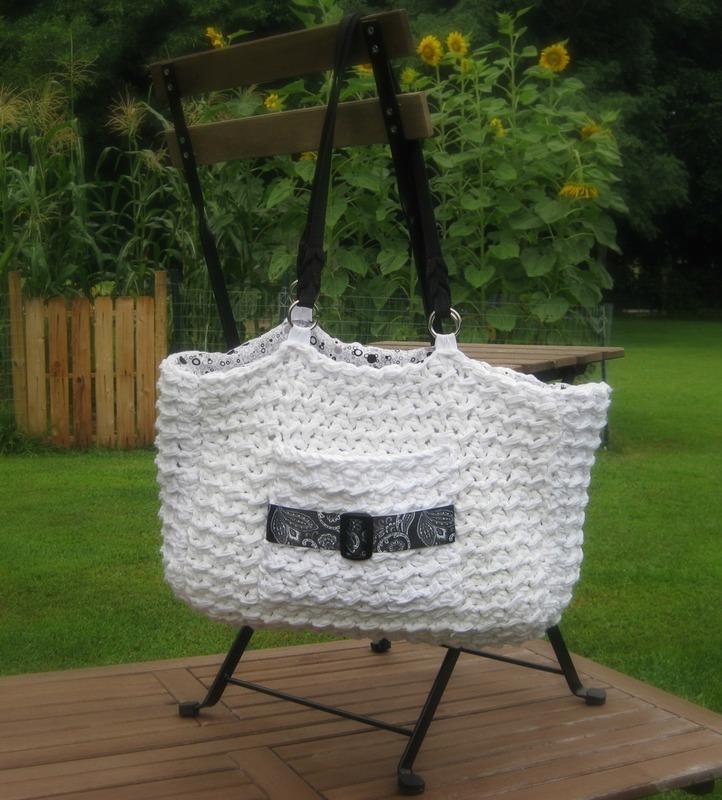 Buckle Bag - Free Crochet Pattern - love. life. yarn. Be sure to check out the lining tutorial for help assembling this tote! I created this bag to take to the CGOA conference a couple of weeks ago. I wanted a large tote (this measures 11″ tall x 14 1/2″ wide and 5″ deep) that I could carry all of my class info and papers in. I like chunky textures so I used three strands of Lion Brand Cotton-Ease held together with a P hook – it worked up super fast. The pocket on the front carried business cards and keys. Since I wanted it to keep its shape I gave it a fabric lining and added real handles instead of crocheting them. Ch 2 at beg of row counts as hdc. Row 1: Ch 2, sk 2 ch, *sl st into next ch, 1 hdc into next ch; rep from * ending sl st into last ch, turn – 30 sts. Work even in St Pat until piece measures 11 inches from beginning. Repeat row 1 of front – 10 sts. Work in St Pat on 10 sts until piece measures 36”. Repeat row 1 of front – 16 sts. Work in stitch pattern for 16 rows. Fasten off. Sew ribbon in place around pocket, placing slide buckle through ribbon before stitching. Sew lining fabric to back of pocket, if desired. Center pocket on front and stitch in place on three sides, leaving top open. Lined bags only: Create backing for panels by cutting backing fabric same dimensions as crocheted pieces and hand stitching to backs. seam allowances on all sides. Lined and unlined bags: Sew front and back to side/bottom strip. side of fabric showing inside bag. Attach handles. That’s it! If you don’t want the fabric lining it is amazingly easy – if you do want the lining and are intimidated, don’t be! I have completed a tutorial to help guide you through the lining process. It can be found here. I can not wait to make one of these bags!!! Thanks! Send me pictures when you do – I would love to post them! Wow!! I will put it on my looong to do list..lol..very pretty! I love this! I just started crocheting this week So this is a project for down the road. Feel free to make and sell these with credit for the pattern. I would also advise that you add interior pockets as that was the thing I wished I had done! If you need help I could walk you through it – not much more work and so much more functional. With two small kids I was always searching for the small things I didn't put in the front pocket! Please share pictures when you make these – and you can add them to the project page on ravelry, too so everyone can see them there. Good luck with your Etsy shop!! I am waiting on 6 skeins of the charcoal cotton ease yarn to arrive any day now and am going to make the first one for my sister her bday is on the 19th of nov. I so i will def. post pics when i'm finished but i am going to definitely make a few for my etsy shop and i'm sure they will sell great.. I would love a tutorial on making the pockets on the inside lining. i've made purses before and lined them but i have yet to attempt the pocket so if you have it figured out i would greatly appreciate a tutorial on the inside pocket. thanks so much you are already contributing greatly to my shop and i really can't thank you enough! (ps.. do you drink wine?) my family owns a winery a thank you bottle i believe is in order…? Thank you for this lovely pattern and am looking to make one for myself. You are so welcome! 🙂 If you make one I would love to see pictures. Beautiful! I love making crochet purses, bags, totes, etc. I can’t wait to give this one a go! I made the purse this weekend and I love it! I’m not fully finished (Need to sew on the insert and handles) and won’t be for a couple of weeks. (Hurt my hand) I ended up using acrylic yarn. I couldn’t find 24/7 Cotton (I was too impatient to buy on-line 🙂 ) which is the comparable to the yarn used in the pattern. But, I still think it came out really good! To get the correct gauge I used an N hook (10 mm) with 2 strands of yarn. I have no idea how to post pics, but would love to show you. When finished, it will be my new favorite purse! Thanks for the pattern! Yay!! So glad it turned out well 🙂 Let me know when you are done because I would love to see it. Hello Amanda, I just want to say that I love your patterns, and video tutorials, thank you so much. I specially want to thank you for allowing us to sell our finished items while giving you the credit for the patterns, I have search and is hard to find people that are ok with reproduction of their work. thank you and hope to see all the new things you will be creating. Thanks Teresa! Before I began designing I wanted to make and sell items and it always frustrated me when I would find a cute pattern and was not allowed to sell the finished items. 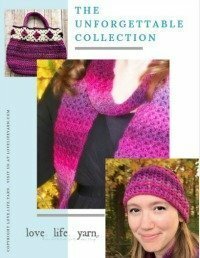 Once I started making my own patterns I wanted everyone to feel free to make and sell the finished products – crochet and knit items are great for craft fairs and things like that! Unfortunately I get bored after making something once so I am always ready to move on to the next and couldn’t make myself knit or crochet to sell the items themselves – patterns have been the way to go for me. 🙂 Good luck in your endeavors!